Of all the forms of non-verbal communication, color is the most instantaneous method of conveying messages and meanings. Our very survival depends on the ability to identify necessary objects and/or warning signals from colors that we relate to them. Often called the "silent salesperson," color must immediately attract the holder's eye, convey the message of what the business is about, create a brand identity, and most importantly help to make the sale. Much of human reaction to color is subliminal. 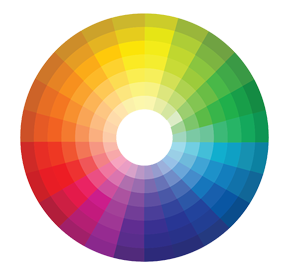 Consumers are generally unaware of the persuasive effects of color! Red is the warmest and most energetic color in the spectrum. Red symbolizes passion, provocativness, excitment, dynamics, speed, strength and urgency. Red enhances human metabolism, increases respiration rate and raises blood pressure. In China red symbolizes celebration and luck and is used in many cultural ceremonies. In India red is the color of purity. Orange is a fun and playful color, not to be used to convey a serious message. Orange symbolizes balance, warmth, enthusiasm, vibrancy is demanding of attention. Orange, along with red and yellow have been shown to exert a measurable effect on the autonomic nervous system, which stimulates the appetite. In Ireland orange has religious significance (Protestant). Often used in high visibility clothing and other safety equipment and objects. Taste-wise, orange is connected to the sweet tang of the fruit that bears its name. In nature, yellow is one of the most unignorable of colors. Yellow symbolizes joy, happiness, optimism, idealism, imagination, hope, sunshine, summer, gold, philosophy, spirituality and inspiration. Studies show that most American prefer yellows that are sunbaked and warm, such as a sunflower petal. In Asia yellow is sacred, and imperial. Green is one of most-often cited favorite colors. Green symbolizes nature, environment, health, luck, money, youth, vigor and generosity. Green is a healing color, the color of nature. It is often worn in operating rooms by surgeons. Green has become the symbolic color of environmentalism. When "all systems are green," it means everything is in order. Blue is often considered to be the safest global color. Blue symbolizes peace, tranquility, stability, trust, truth, confidence, conservatism, knowledge, power, integrity, security, cleanliness, sky, water and cold. Blue can slow the pulse rate, lower body temperature and reduce appetite. Blue is considered a business color because it reflects reliability. In China, blue is associated with immortality. For the Jewish faith, blue symbolizes holiness. Pharaohs wore blue for protection against evil. If you are "true blue" you are loyal and faithful. Purple is a good color to use when targeting younger customers such as children. Purple symbolizes royalty, power, luxury, spirituality, dignity, nobility and enlightenment. According to surveys, almost 75 percent of pre-adolescent children prefer purple to all other colors. Purple is a very rare color in nature. Leonardo da Vinci believed that the power of meditation increases in purple light. Purple is said to help develop the imagination. Black can be seen as the color of authority and seriousness. Black symbolizes power, wealth, elegance, sexuality, secrecy, sophistication and formality. Black is one of the most mysterious colors and often evokes feelings of class and elegance. Native Americans associate black with the life-giving soil. If a business is "in the black" it is making money. Black is associated with sophistication and elegance. White is what we see when all colors come together in perfect balance. White symbolizes purity, simplicity, cleanliness, peace, precisioness, innocence, winter, snow, good, sterility, and marriage. White is often used in the medical industry and is also associated with healthy foods and dairy products. Copyright © 2004-2014, GreatFX Printing, LLC. All rights reserved.